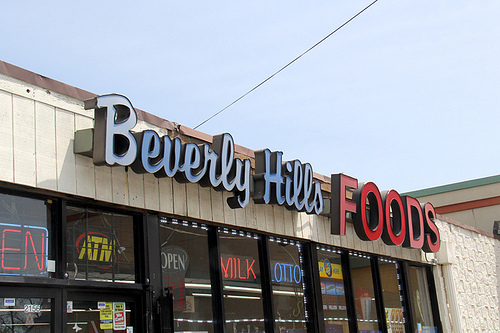 A Beverly convenience store prides itself with the neighborhood’s hilliness. 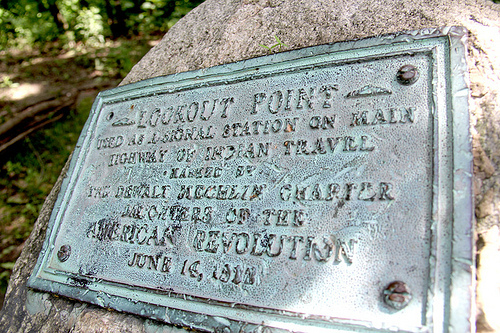 A historic lookout point at the Dan Ryan Woods at 87th Street and Western. From here, you can see the top of the Willis tower, almost 10 miles away. It turns out Elizabeth’s guess is, well, quite a bit off. But it is so darn flat here! It feels like anywhere could qualify. I like to say it to visitors at random times when we’re out and about. But joking aside, there is an answer. We established one rule: Any high point in the city would have to be natural. Apart from avoiding the obvious no-go Willis Tower and other buildings, this mission’s a little tougher than you might imagine. Think of a hill you’ve seen around the Chicago area. There’s a good chance it’s a landfill of garbage or some combo of soil, gravel and sand. The hills of Hegewisch — technically the tallest land masses within the city limits by about 100 feet — are mostly off-limits because of their toxicity. So why is Chicago so flat? We’re on the edge of the Great Lakes Basin, pretty much at the bottom of the bowl. The Valparaiso Moraine to the west and south funnels water down to the lake, which is our lowest point, at 577 feet above sea level. (At least we got that on cities that rest on the coasts.) This is all because 14,000 years ago, Lake Chicago rested on top of this land, formed by a retreating glacier that left the whole area pretty featureless. On average, high points in the Great Lakes states lie 500 miles from a lakeshore. There’s also the issue of geologic engineering. Chicago has been raked by glaciers, drained, burned, bulldozed, and dug up for centuries now. Who even knows what the physical land used to really look like? For example, Stony Island Avenue was named after what was probably an island in Lake Chicago. The outcropping contained marine fossils, asphalt and the striation that captured glacial movements. However, by the 1920s, it was ripped up in the name of development, despite being recommended for reservation by the Geographic Society of Chicago in 1917. To answer Elizabeth’s question, I pulled up United States Geological Survey topographic maps and looked to that ancient lake’s edge, which ran along what are now blocks in the 90s. That’s the circuitous route this carpetbagger took to find an answer. Locals, though, would have told me to look south immediately. Beverly lies north on the Blue Island Ridge. Unlike Stony Island, Blue Island is a moraine, basically more glacial debris. I scoured the contour lines and identified a few hilltops that were higher than 670 feet. Now that I selected my peaks, I needed a Sherpa. I called up my friend, Matty Ryan. He grew up in Beverly and is a natural tour guide. Curious City producer Logan Jaffe joined the party as well, armed with cameras. We started on Longwood Drive, which runs along the shore of Lake Chicago. You can see the sloping lawns that have smoothed out the natural ridge a little bit. Beverly is really nice. It used to be referred to as the suburbs and it sure has that feel. The streets are kind of “protected” by one-ways, turnarounds, and cul-de-sacs, allegedly built for safety but ask an honest resident and they’ll tell you they continue to maintain the segregation that makes you feel like you’re in Winnetka when Auburn Gresham is less than a mile away. We were still at 660 feet here in the Dan Ryan Woods park, but we did actually have a hilltop to look down and a cool view of the Loop. To the east, there was a dubious marker in a copse of sycamores. Nice views and shady history aside, turns out this point is only at 660 feet. This hill is not technically the highest point, but it does offer the highest natural viewpoint. We reoriented and walked down Western Avenue to the other 670-foot contour interval that begins at 91st Street. There was literally no discernable elevation gain, though there was plenty of traffic. 92nd Place and Western might have a view of a Menard’s and neither the green hills nor the view at the Dan Ryan Woods, but the corner carries a unique, remarkable feature: Rainbow Cone, a Beverly institution. For the uninitiated, the signature treat is chocolate, strawberry, Palmer House, and pistachio ice creams plus orange sherbet piled on a cake cone. Matty used to work there in high school. “It takes awhile to learn how to make a cone like that,” he said. A magical treat for a magical spot. Elizabeth, you should get one and then take a walk back to 87th to get the full Top of Chicago Experience. Special thanks for research help to Edris Hoover at the Ridge Historical Society.